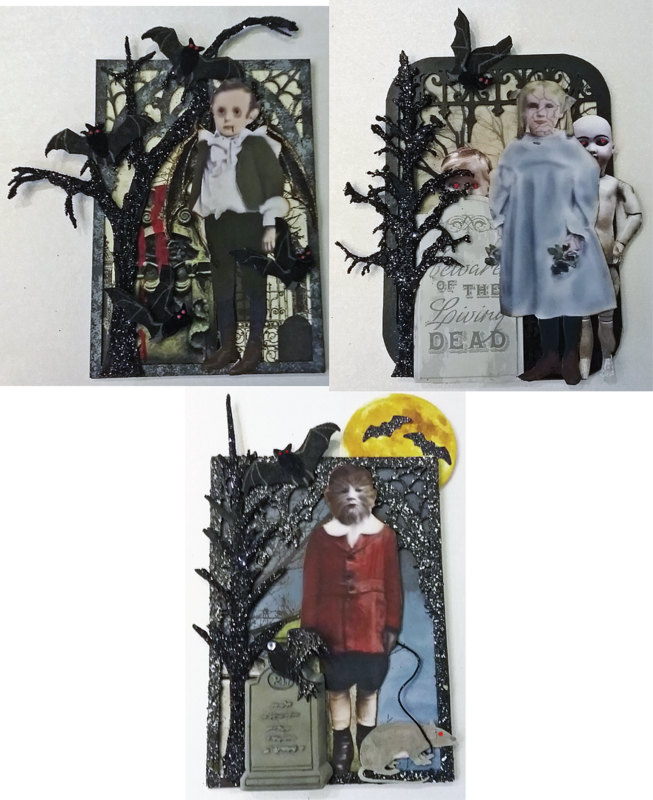 These ATCs are cards I submitted for a Halloween swap hosted by AlphaStamps. 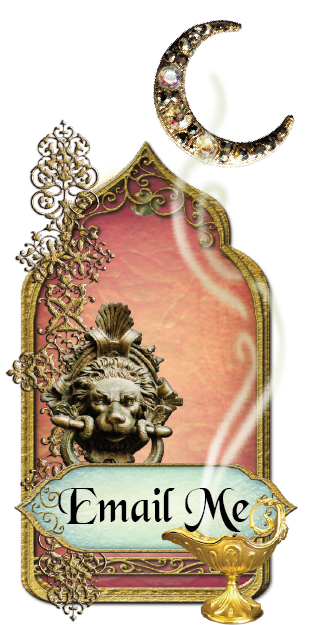 The base for the card consists of an ATC sized piece of chipboard and decorative frame. The card and frameset, are available in three designs. I used the Dragon Arch and the Wrought Iron designs. The images of children can be found on the Little Imps and the Little Darlings Collage Sheets. The original images are in black and white so colorized them to make them creepier. The chipboard arch is stippled with various shades of grey, going from dark to light, to create the appearance of stone. 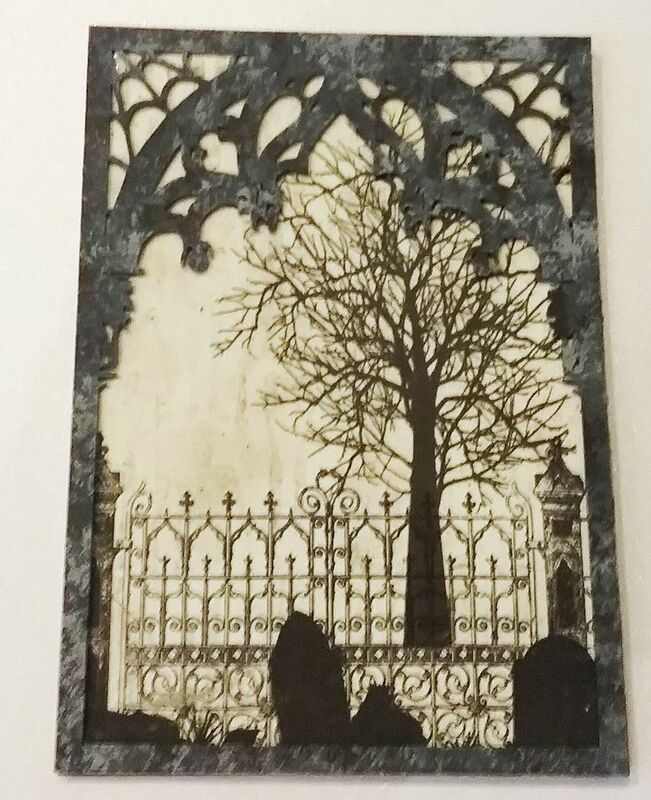 The fence and tombstones are printed on the decorative paper and the tree is a rub-on transfer. 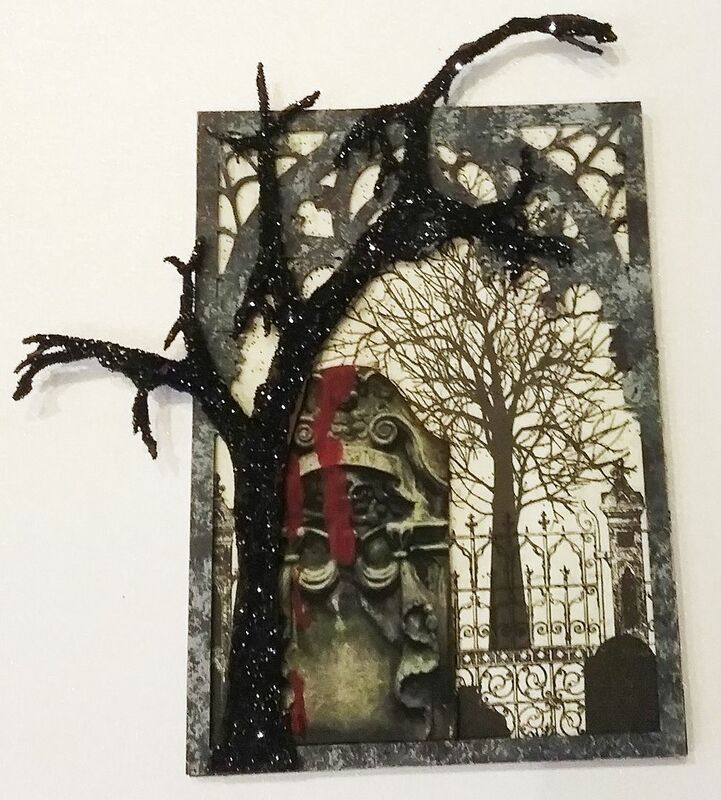 I added a tombstone with dripping blood (paint) and a creepy tree covered in black glitter. I colored the boy's clothes, added the red circles and dots to his eyes, and the blood dripping from his mouth. The final touch is dimensional felt bat stickers. 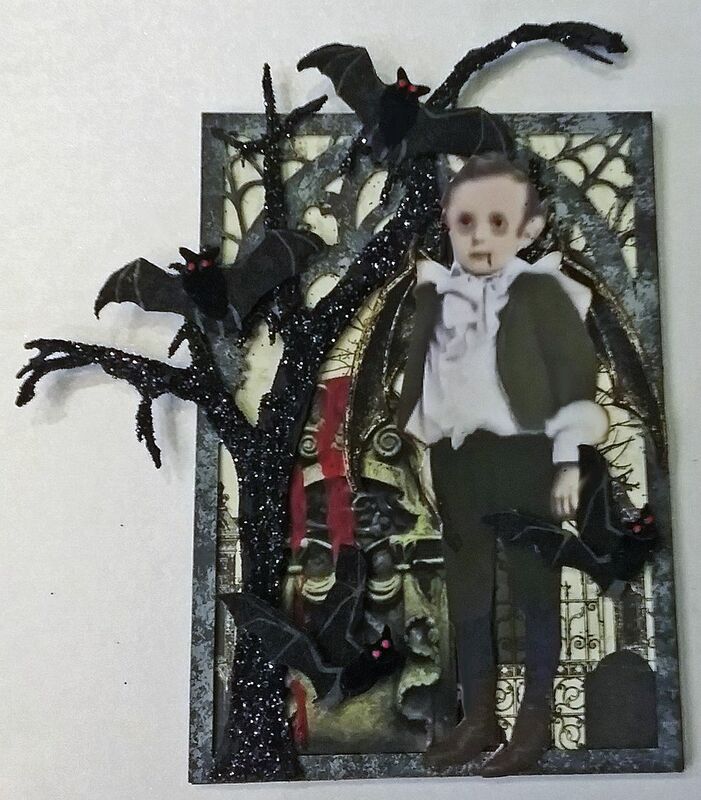 In the background is paper with winter trees, the wrought iron frame is painted black, and the creepy tree is covered in black glitter. I added a tombstone that says "Beware of the Living Dead". 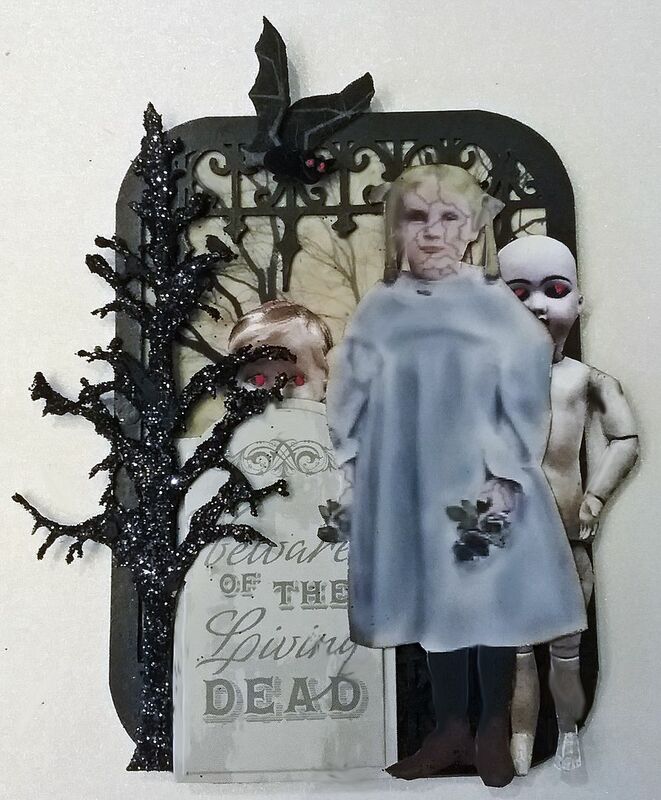 Behind the tombstone and the girl are creepy dolls to which I added red eyes. The creep factor is enhanced by having the red eyes of the doll behind the tombstone, peek through the tree branches. The doll images are from the Dolls in the Attic Collage Sheet. I colored the girl's dress and face plus added cracks giving her the appearance of being a porcelain doll. The frame on this card is sprayed with stone spray paint. 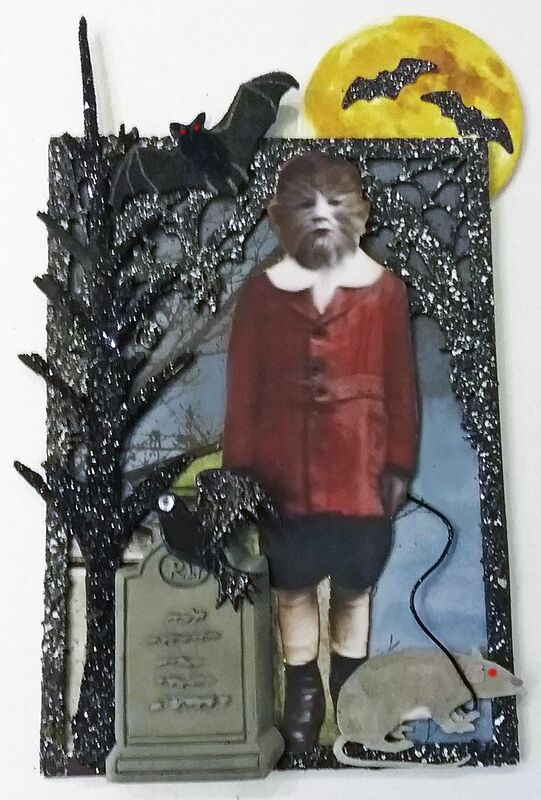 Embellishments include a tombstone, moon, glittered bats, dimensional bat sticker, a creepy tree, and a crow. I colored his jacket red and added the fur to his face. On the wire leash is his pet rat. you are so so talented!That werewolf is amazing!